Wait, Superior Spider-Man? Didn't this book end like 6 months ago? Didn't Otto die and...stuff? Well about two thirds into this books life, we were reacquainted with Miguel O'Harra, the Spider-Man of tomorrow. During that story arc, Otto flipped some switches and pressed some buttons and disappeared for 24 hours. This is where he went. Being sucked through time and space, unsure where he was going to land, Otto Octavius just straps in and goes for the ride. A ride he's not sure even he can survive! Where he ends up isn't so shocking, as we have in our time the resident of Otto's destination, the year 2099. He finds the local authorities rather quickly and instead of running like Miguel, Otto decides to fight back. Something they weren't expecting. In all the commotion Otto meets Miguel's brother, who recognizes Spider-Man from that other time they met. * Some skilled hover car driving later and they both escape all the ruckus. Back at Miguel's apartment, Otto meets his A.I. a house robot hologram thing that basically acts like Siri, but not as mean. He immediately kicked out Miguel's brother and starts getting to work on building a machine to send him back to his time. By no means does this mean Otto has to get the parts in a heroic way. After all, he's not even in his own time. If he has to steal, which he does, he will, which he did. His machine is ready, and he's even changed the A.I. to look like his beloved Anna Maria Marconi. His first jump leads him to a fiery world. The Fantastic Four are found dead, but so is...Spider-Man? It seems he's been sent to an alternate world. One where Spider-Man has become the fifth member of the world first family of super heroes. All the good that did him, laying there with two puncture wounds in his chest. A couple more jumps show the same exact results. The House of M timeline, dead Spider-Man. If Iron Man's post Civil War world continued, dead Spider-Man. Every single one bearing the same fatal town stab wounds to the chest. This can only mean like 3 things, but one of them is really obvious. Someone is time jumping and killing Spider-Men. We're now taken to a place that looks like somewhere in Asia. Maybe the Middle East. This Spider-Man is being hunted as well by the man killing his other worldly brethren. It is a man in a suit and an old school divers helmet type thing. Look, I don't write this stuff, I know it's crazy. Just as he's about to stick a fork in this worlds Spidey, Otto appears and catches him off guard. He's finally found a way to track this man and see where he's going next. Otto talks the young man in joining his side to hunt and defeat this villain. He believes he's the first to join Otto's team, but Otto has been up to some work and already had a nice good number of guys. 5 already, to be exact. The next story is the same as the last, Otto traveling to another world to recruit a Spider-Man. Only this one is told from the perspective of that world's Spider-Man. This dude is kinda badass. He's still Peter Parker, but it's like if the Punisher became Spidey. He knows pain and knows he can't let people get away with hurting others. He even uses a gun! And the encounter with him and Otto is a bit on the rocky side. Some more stern convincing is needed but he agrees to go with him. Otto is building an army that we will get the full blast of this fall in the Spider-Verse. I personally can't wait for this. 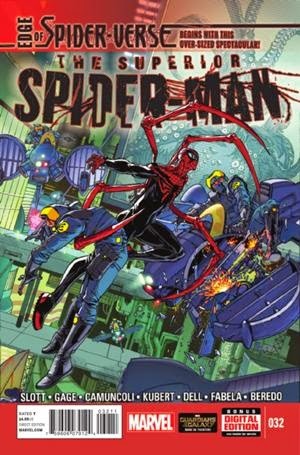 I haven't been reading comic for too long, but I've been a life long Spider-Man fan and this is the first time I'm really getting a big crossover Spidey story seeing as I wasn't around for Spider-Island. I hope it's here in no time! Until next week!